Welcome to Week 31! That’s one puzzle every day for a month! 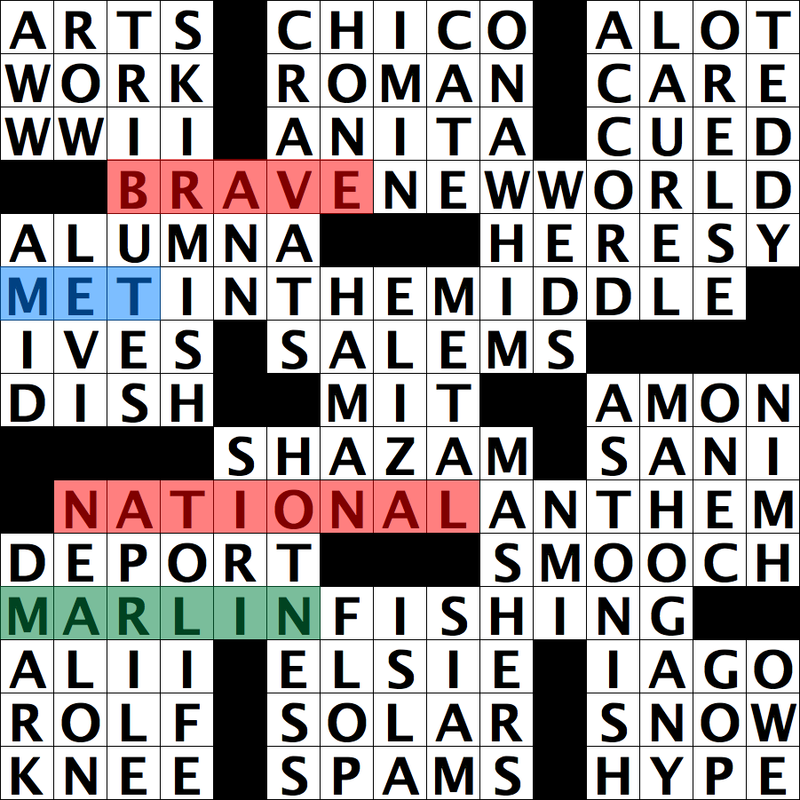 The first word of these entries were BRAVE, MET, NATIONAL, and MARLIN, which correspond to four out of the five MLB teams in the NL East. Specifically, they each begin with what a single player of that team would be called. The only NL East team not featured in the puzzle are the Philadelphia Phillies, so the meta answer had to be something green that starts with the word PHILLIE. A quick Google would point to the team’s mascot the PHILLIE PHANATIC, which is the answer. A couple of solvers seemed to be unsure of whether PHILLIE PHANATIC could be right, as it was directly related to the baseball team. However, the Phillie Phanatic is the best answer, as it is really the only thing that begins with the word “Phillie”. Unfortunately, “Philly” is not a single player from the Phillies, because if it was, the meta solution would be a food item. I could have picked the NL Central, as all the teams there have easy to use names, but I’ve been a lifelong Braves fan, and I’m currently typing this in an Atlanta hotel as my family is seeing the Saturday and Sunday games at Turner Field. This week, 28 readers submitted the Phillie Phanatic. This week’s randomly selected winner was David Cole. He will join Jon Delfin, John L. Wilson, Jim Quinlan, Eric Maddy, and Andy Keller in a future section of the site. This weekend I’m in the home of the Braves, but next weekend I’m in the home of the Nationals! The Indie 500 is this upcoming weekend! I’ll be there wearing the Gamecock hat, so be sure to say hello. I’ll have a long write-up about the event on my blog two weeks from now, as I am positive I won’t be able to write a decent one between the event’s end and my Sunday noon deadline. There will still be a new puzzle next week, and I’ll have some cool stuff for you to ponder. I’ve been doing some data mining regarding my puzzling experience, and I’ll have new stuff for you over the next few weeks. Enjoy this nice straightforward puzzle, and I hope to see you in DC!